Belle Époque is a 1992 Spanish comedy-drama film directed by Fernando Trueba. The title does not derive from the period in French history known as the Belle Époque ("The Beautiful Era") but from the days before the Spanish Civil War. 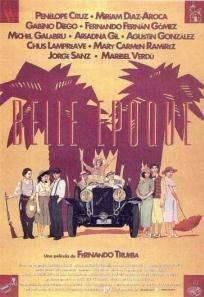 Belle Époque received the Goya Award for Best Film along with eight other Goya Awards and was named Best Foreign Language Film at the 66th Academy Awards. Belle Epoque received positive reviews getting a 93% on rottentomatoes.com. The film is mentioned in the 2010 American film The Fighter. ↑ "Belle Époque". Box Office Mojo. Retrieved 29 July 2013. ↑ "Berlinale: 1993 Programme". berlinale.de. Retrieved 2011-05-30.